Expanding overbraid as used by Redline Tuning when making stand alone ECU engine and car looms. Sold in 1m lengths. The special braid construction permits the sleeving bore to be expanded up to 300% and a particular feature is the retention of roundness. You cannot build a custom engine harness or wiring loom without protection and this is perfect for the job. 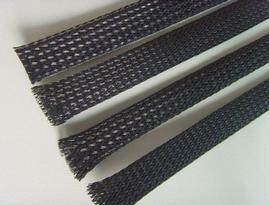 wiring over braid, loom over braid, loom protection, loom sleeving, harness protection, wiring harness protection, wiring harness sleeving, wiring harness outer sleeving, expandable over braid, expandable engine over braid, expandable harness over braid, engine loom covering, enigine loom protection.